It is a large dog, usually measuring about 65' 75 cm (25 30 inches) at the withers. It is a hound, and therefore should be kept in optimum working condition. It tends to be heavier boned than most sighthounds, but shares the depth of chest and basic body structure. Its facial structure is considerably different from that of a Caravan Hound, as it is meant primarily for hunting wild boar. The tail has a slight curl. The most prized colour is milk white, with a pink nose and golden eyes. However, other colours including spotted or solid, black, and brown, are known to occur. The spots will start showing up by 80 days from birth. In the past, puppies of colour were usually culled from the litters since the owners preferred the pure white dogs. The coat is short and fine. An extremely handsome and graceful dog, the Rajapalayam has a gait similar to the trotting of a thoroughbred horse. As with many fully white dogs, there is a high incidence of deafness in this breed. Puppies born with whitish or blue eyes are deaf. 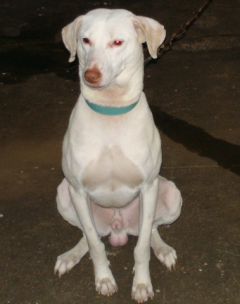 Many Rajapalayam dogs suffer from mange, though this is usually not a serious problem. Though the breed dates back a few centuries, the creators of the breed unwittingly ended up fashioning an albino dog, characterized by the pink nose and the lack of pigmentation. The Rajapalayam was used predominantly for hunting wild boar and as a formidable guard dog. It needs wide open spaces and is very affectionate and devoted towards its owner, although not always demonstrative.They do not usually like to be touched or handled by strangers and are known to be one-man dogs. Most specimens are aggressive and hostile towards strangers, and will attack intruders. Socialization in puppyhood is important. Rajapalayams usually do not get along well with other pets like cats, owing to their strong hunting instincts. Rajapalayam hounds were primarily bred and used by Nayak dynasty of Tamil Nadu, it is speculated by some researchers that the Rajapalayam may have been one of the dogs used in the breeding of the modern Dalmatian. The Rajapalayam dog was used during the Carnatic Wars and Polygar War to attack the British cavalry in battle as Rajapalayams were very fast,strong and aggressive in attacking the opponents. It is also believed that once 4 Rajapalayams saved the life of their master fighting against a tiger and killing it bravely many years before near forest in Virudhunagar district of Tamil Nadu. They are largely used to guard the rice fields,houses and farms. Since last two decades Indian Army started using them as guard dogs to support the army in the borders of Kashmir.